Generally speaking, when I order fabric from Moodfabrics.com, there is usually some sort of order and reason behind it. I start with a swatch, cross my fingers that the fabric doesn’t sell out before the next month (which, unfortunately, does happen occasionally! ), and then place my order based on whatever plans I have determined for the fabric. Sometimes, I find a fabric that sounds interesting and just order it on a whim without swatching first, or even considering what I’ll make. And, as you might guess… sometimes that backfires. Which started out to be the case with this month’s fabric, but SPOILER ALERT there’s a happy ending. I found this Helmunt Lang glazed french terry (now sold out, sorry!) back in September, and ordered 2 yards. I loved the charcoal color and generally adore french terry. What was so weird about this fabric is that it is STIFF. It’s not the soft, cozy hand that you generally associate with french terry – it feels like a bath towel that has been left to hang dry on a clothesline. It’s scratchy, it’s stiff, and I’ll just be completely honest – I didn’t like it at all and was kind of bummed that it took up such a big part of my order. I tried washing it repeatedly with different cycles (hot, cold, high dryer heat, etc) which didn’t do anything to soften it. Not sure if the glaze is why it feels like this, but I wasn’t a fan. However, I had this fabric and I was stuck with it, so I spent a few months trying to figure out if there was something I could still use it for. When I received Tilly and the Buttons Stretch! book earlier this year, one of the projects is a hoodie & joggers combo. 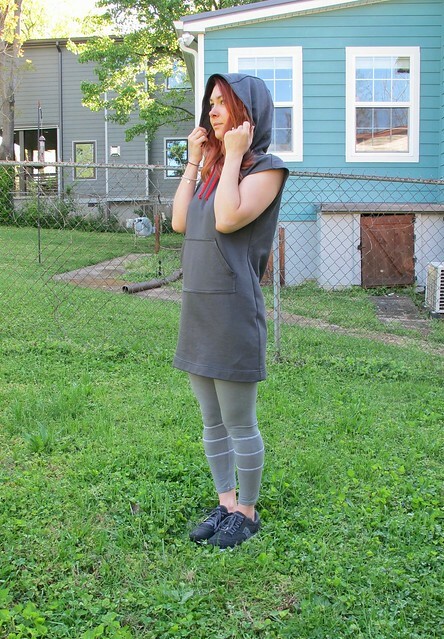 I’m not a huge fan of the athleisure trend, however, I LOVED the hack for turning the hoodie into a sleeveless dress. 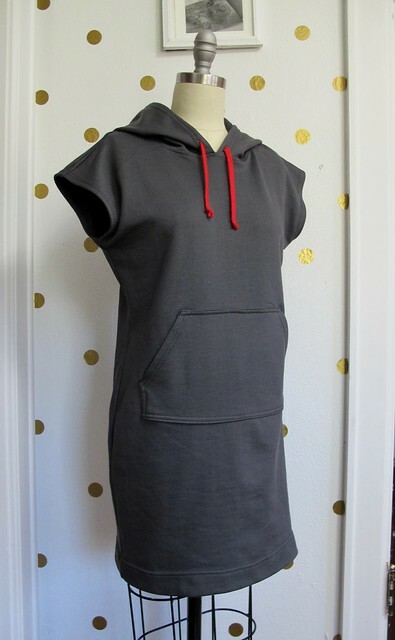 I wondered if my unused french terry would work as a dress – the stiff-ish hand would work for the structured shape of the dress, and the rough texture might actually be ideal as a swimsuit coverup. So that’s what I went with – and even though I was admittedly pretty apprehensive about the whole thing up until hemming, I’m actually quite happy with how it turned out! One benefit of this fabric is that it’s easy to work with – about as easy as a woven cotton, as it doesn’t move around, or curl when cut. It does shed a little after it has been cut, but no worse than your standard sweatshirting or french terry. I whipped this little dress through my serger to seam, with my coverstitch machine for hemming, and had it done in an afternoon. The drawstring feeds through button holes, which my machine had no problem sewing on this stable fabric (I did back them with interfacing first). 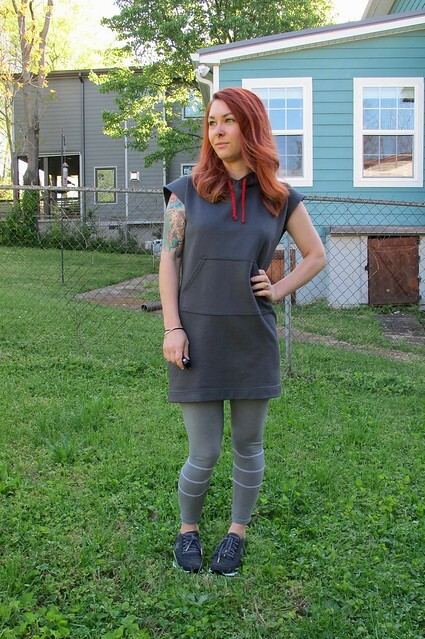 I originally envisioned a black drawstring, but red was all I had on hand – and I actually like it! I did this project as a bit of a trial run, without considering that I’d actually want to wear it when it was finished – but I’m pretty happy with how it turned out! The fabric is a lot less uncomfortable when I’m actually wearing it, especially since the loose-fitting dress doesn’t really rub against my skin. 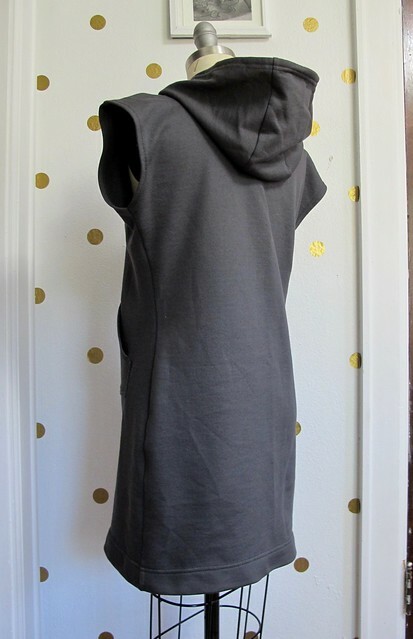 I still think it will make for a cute swim coverup, but it also works as a cute little hoodie dress with leggings! And look, I’m rocking some athleisure, like I said I wouldn’t. Oh well! 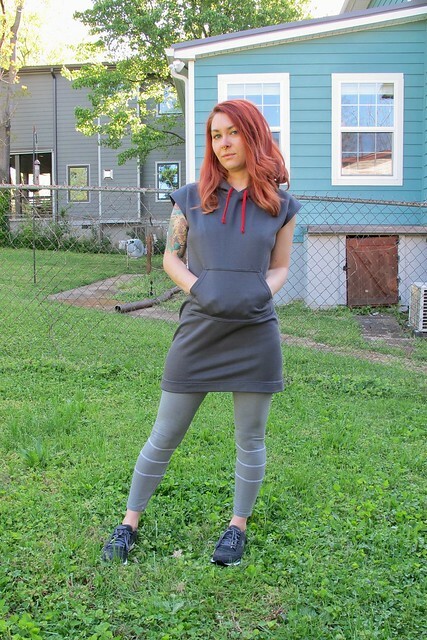 With all that being said, if you are in the market for some ACTUAL SOFT french terry, I highly recommend the bamboo french terry on Mood’s website. I ordered a few yards of this stuff (after swatching first!) and it is DREAMY. 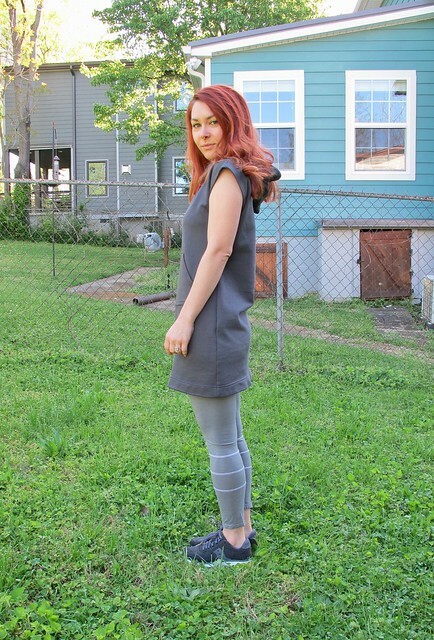 Super soft, lightweight, drapey, and come in an array of rich colors. Plus, it’s bamboo!